Using colour in interior design is important. You can express your personality and create a space that you love by choosing colours that reflect you, whether it be through bright, vibrant colours or dark and earthy tones you can create a real impact. 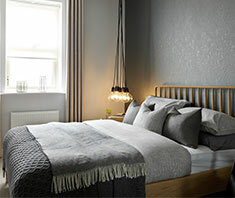 We have some helpful tips on how to work with colour and how to get the very best out of your room. Interior design can be overwhelming at the best of times, never mind when you bring colour into the mix. It can be scary, especially if you don’t have a natural eye for interior design. But, you shouldn’t let that stop you, whether your colour confident or colour shy the best place to start is to pick the colour you want to decorate with and create a colour chart. Once you know what colour scheme you want to follow, a chart will allow you to see exactly what colours go well together.The colour scheme you choose, can create a mood or, enhance a persons style. People often avoid dark colours when designing a room. It has connotations of being gloomy and depressing, while making it feel small and claustrophobic. But, when dark palettes are executed properly they can make a room feel cosy, slightly dramatic and full of life and this goes for any room, of any size. 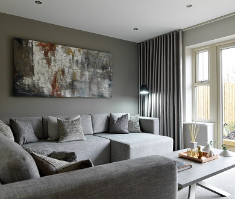 The usual rule of thumb is to use light colours in a small room to make it feel bigger, and although this does work, don’t be afraid to try darker tones. It can give the room a much bigger presence than it might otherwise have. It’s also important to create contrasts and a sense of balance. A mix of materials is essential as well as the odd pop of color which will work really well against a dark background. 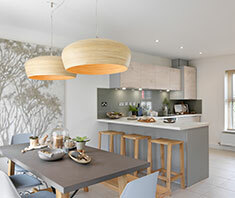 Shades such as white, beige and ivory appear to be without colour but there’s always an undertone to these hues, making it easier to know what neutral tones to use together. Some neutrals can have pink, peach or even yellow undertones. If you’re trying to achieve an all neutral look, you should layer different hues of the same colour for a classy and sophisticated look. It’s always better to go for lighter colour on the walls with darker upholstery. Using bright colours can be intimidating. You want to make a statement and add a point of interest and fun but it can be hard to know what colour to go with, where to put it and if it will be in keeping with your homes overall look and feel. In whatever room you decide to add colour to you should always go with a white background, this will allow the colours to pop, making them look bright and vibrant. Bright coloured furniture can also be a great way to bring colour into your home without completely redecorating the whole room.